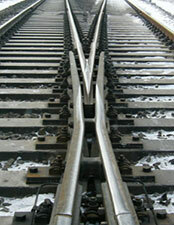 Railway frog is an important part of the rail switch (rail turnout) and the intersection of two railway lines. Whether a railway train can safely cross from one railway to another, the railway frog plays a vital role. High-quality railroad frog can ensure the train transfer smoothly to another rail line, and the passengers in the train won’t feel abnormal bumps. 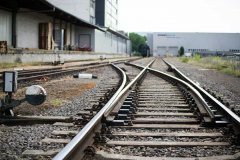 On the contrary, if the rail frog technology is not good or the turnout in railway is selected with inappropriate rail frog, the irregularity will occur when the train passes. Therefore, the choice of high-quality railway frog is particularly important for the safety of the rail switch and even the whole railway line. The rail frog can be divided into a straight frog and a curved frog according to the plane type, and it also can be divided into a fixed frog and a movable point frog (swingnose crossing) by structure type. Rail bound manganese frog (RBM rail frog) is a kind of one-piece cast frog with manganese steel. Because the simultaneous casting of the crossing nose and the wing rail, the rail bound manganese frog’s integrity and stability are better. High manganese steel is a kind of alloy steel with both high contents of manganese and carbon (manganese 12.5%, carbon 1.2%). 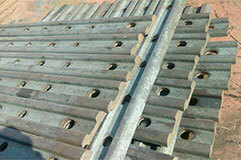 The railway frog cast with high manganese steel has higher strength and good wear resistance. Therefore, the rail bound manganese frog has a longer service life and more convenient maintenance. 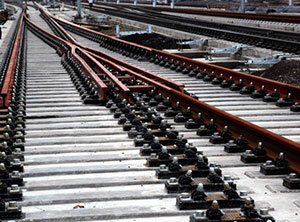 The combined type rail frog is made up of the crossing nose, the wing rail and other parts. The railway frog of this structure is easy to use. Due to it has no special process requirements, so the process and manufacture technology is not complicated. Because of the assembled structure, the combined type rail frog has more separate parts and need more maintenance work. The movable point frog refers to a railroad frog structure with movable parts. Because the railway frog is partially movable, the harmful space created on the fixed frog is eliminated and making the train runs smoothly. The movable point frog has three types, they are crossing nose movable type, wing rail movable type and other movable railway frogs. The crossing nose is movable and the wing rail is fixed. When the train changes its orbit through the rail switch, railroad frog guides the train into the correct track through the movement of crossing nose. This type of rail frog has the advantage of good lateral stability and will not cause the train to derail due to the wrong track. Its disadvantage is that the rail frog is relatively long and complicated to manufacture. This kind of rail frog structure has fixed crossing nose and movable wing rail. It can be divided into two types: one-sided wing rail movable and two-sided wing rail movable. Movable point frog can effectively improve the speed of the train passing through the rail turnout, which is widely used in high-speed railway lines. The movable wing rail frog has poor lateral stability compared to the crossing nose type frog, and the structure of the fixing device is relatively complicated. For example, Germany’s UIC60 rail switch uses a sliding block to fill the frog flange groove to make the train change the running track. Another example, the flexible movable point frog turnout and movable point frog rail speed-raising turnout have been developed in China. This movable point frog rail speed-raising turnout can be used in cross-regional seamless rail lines. 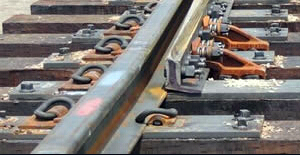 The straight speed of the line laying this kind of rail frog turnout can reach 160 km/h. 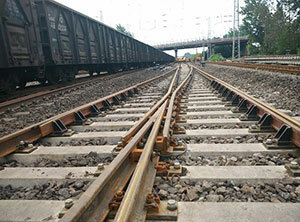 As an important part of the rail switch, the selection of the railway frog needs to be based on the type and size of the rail turnout, and sometimes it needs to be matched with turnout in railway. 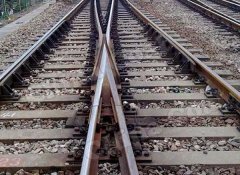 Different railroad frog is needed according to the curvature radius of intersecting railway. 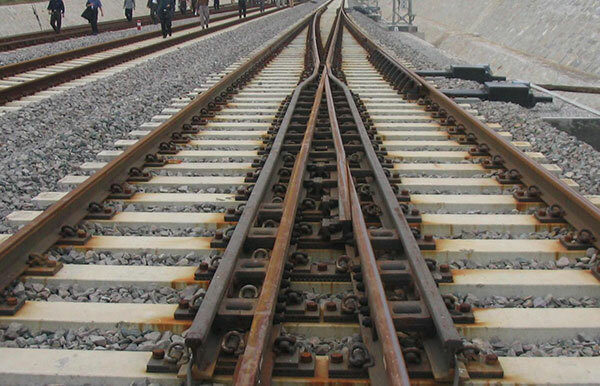 The greater the curvature radius of the turning railway is, the larger number of the railway frog used will be, and the less angle of the rail frog will be. At the same time, the higher speed of the locomotive which is allowed to pass the rail switch, the higher smoothness of the train. The number of railroad frogs required will vary depending on the number of bifurcated railways. 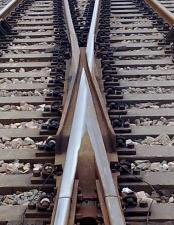 In general, the number of rail frogs required for a single turnout (lateral turnout) in railway is one. According to the actual situation such as the terrain (slope) of the railway laying, special railroad frogs that meet the requirements will be customized. Therefore, we often receive customized requirements from customers and make the frog according to their drawings. The railway frog is also required to be selected for the different types of locomotives crossing the rail switch. Electric locomotives, mine cars, ordinary trains, high-speed trains, these trains have different loads, need to change the track at different speeds, so the choice of rail turnout frog also needs to be different. 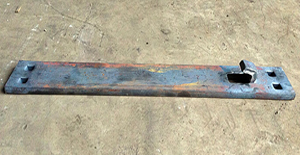 It is a special shape of the rail tie plate, which is specially used for the special size of the rail frog part and the guard rail of the rail turnout. 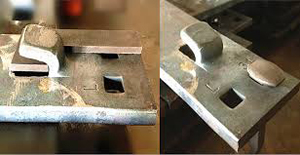 The hook twin tie plate is usually used in pairs and fixed with fasteners such as screw spike or rail bolt. We use new high manganese steel to make the railroad frog. This new material is obtained by re-alloying high manganese steel with elements such as copper, vanadium and titanium, etc. The self-lubrication performance of the high manganese steel frog has been improved with the addition of new elements, thus reducing the friction force between the wheel and rail and improving the service life of the rail frog. The irregularity of high-speed switch frog area has always been a difficult problem in the field of railway safety production. In order to reduce the incidence of irregularities on turnout in railway, the vertical tip hid structure or horizontal tip hid structure are adopted in our railway frogs, which can effectively reduce wheel-rail contact irregularities. 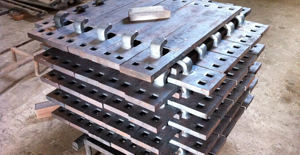 All our railroad frog products are created in accordance with the mold standards. For customized frog products, our engineers will strictly follow the drawing data and carry out multiple product trials until the customer requirements are met. We only make well-made railway frog. 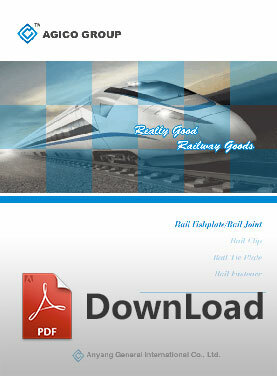 Welcome to send inquiry for more details about railway frog. 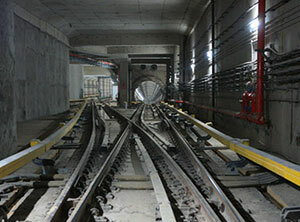 The Huainan Line Reconstruction Project is 75 kilometers in length. During the period of construction, successfully replaced more groups of railroad frogs. 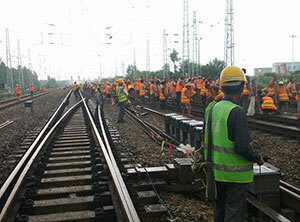 Among them, 139 groups of new railway turnout frogs were laid and 101 groups were replaced. 3. Xuzhou East High Speed Train Project with 51 groups of movable point frog rail speed-raising turnouts were laid.